Each blooming sunflower at the Yamang Bukid Farm has a story. Each strong stem, each robust bud, each healthy leaf is a narrative in itself, intertwined with the caring hands of the farmer who is also writing the tale of his life’s journey in the silence of his heart. Enfolded in the nurturing embrace of nature, farmer and sunflower together create an explosion of beauty that warms people’s soul and paints a smile on their faces. But underneath the sea of a thousand blooming sunflowers at the Yamang Bukid Farm are rarely told tales of hardship and struggle of individual farmers who try to find joy, meaning, and direction in their lives. 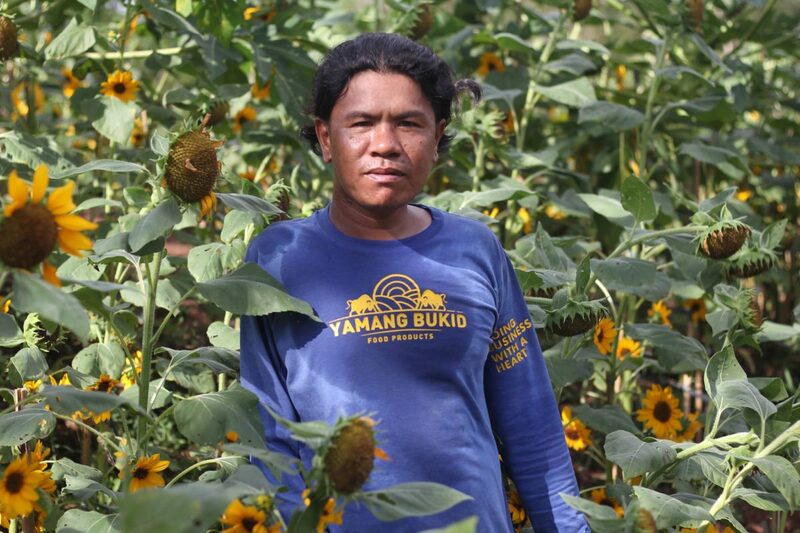 From illegally cutting down trees for a living in the past, one of the farmers at the Yamang Bukid, Sonny Tesado, has taken a complete turnaround and finds himself happily and gainfully taking care of plants at the sunflower farm in Bacungan village. Sonny said that he was naturally inclined to taking care of plants. But the lack of employment opportunity in the barangay had pushed him down the dark paths of illegal logging to feed his family. As he narrated his life’s journey, his face gradually turned sad as he recalled how he cut down trees back then. “Dati nagkokorte ako ng kahoy, pinuputol namin ‘yung mga puno (I used to find trees, then we cut these trees),” he said with eyes revealing the heartaches of his past source of livelihood. Sonny wasn’t proud of his past work in the hilly lands of their village, but back then, he had to endure his guilt just to earn money to put food on his family’s table. With three kids to raise with his wife Inday in the backwoods of Bacungan where he himself grew up, he also had to make “uling” (charcoal) to augment their income. He knew illegal logging is prohibited, but his family’s needs made him choose survival over obeying the law, he said. “Alam din po namin na illegal ‘yon, pero wala po kasi kaming kabuhayan na iba (We know it was illegal, but we don’t have any other means of livelihood then),” Sonny said. Illegal logging, charcoal-making, and other livelihood activities were major sources of illicit livelihood in Bacungan in the past, simply because opportunities were not there. “Natatakot din kami kasi baka maubos na ‘yong puno at alam din namin na mali talaga ‘yon, mali talaga (We were scared too because we might lose all the trees and we understand that it was wrong, really wrong),” he added. Thanks to the Yamang Bukid Health Products, Inc., Sonny and Inday were given the chance to turn around their lives by being hired as workers in the farming community. “Kaya laking pasalamat ko na rin talaga sa Yamang Bukid kasi nakaalis na kami sa ganoong trabaho (We are really thankful to Yamang Bukid because we were able to leave that job),” said Sonny. Sonny, smiling and vividly happy, lacks the perfect words to describe how cheerful and untroubled he feels now working for the Yamang Bukid farm that takes care of people to make meaningful changes in their lives. He said Yamang Bukid has demonstrated that illegal loggers can be more productive —rather than destructive —if given a chance to work as farmers taking care of plants. Sonny said further that Yamang Bukid has given him peace of mind, a secured life, and made him a happy person. All his children are Yamang Bukid scholars. He prays that his eldest son will soon serve the Philippine Navy. With Yamang Bukid, Sonny’s life is as happy and sunny as the sunflowers he plans and nurture. Like sunflowers that follow the sun, he will continue to be happy standing strong.